The Aquatemp swimming pool heat pump is an extremely efficient, economical machine, designed specifically for pool heating. 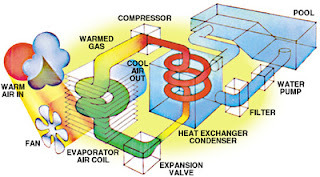 It is similar in operation to that of a typical residential air conditioning system. 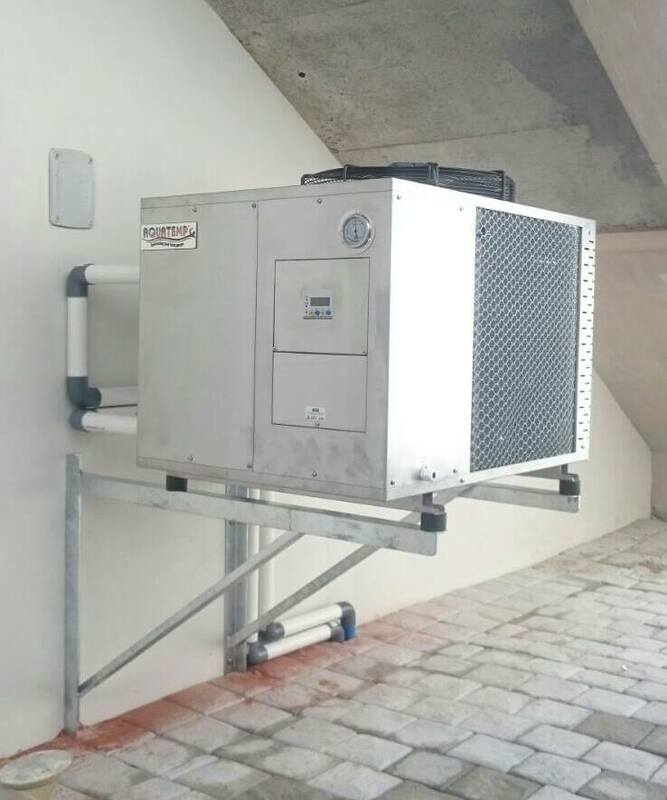 It is, in fact a heat pump employing a hermetic motor compressor in a refrigeration cycle to extract heat from the ambient air and deliver it to the circulating pool water. 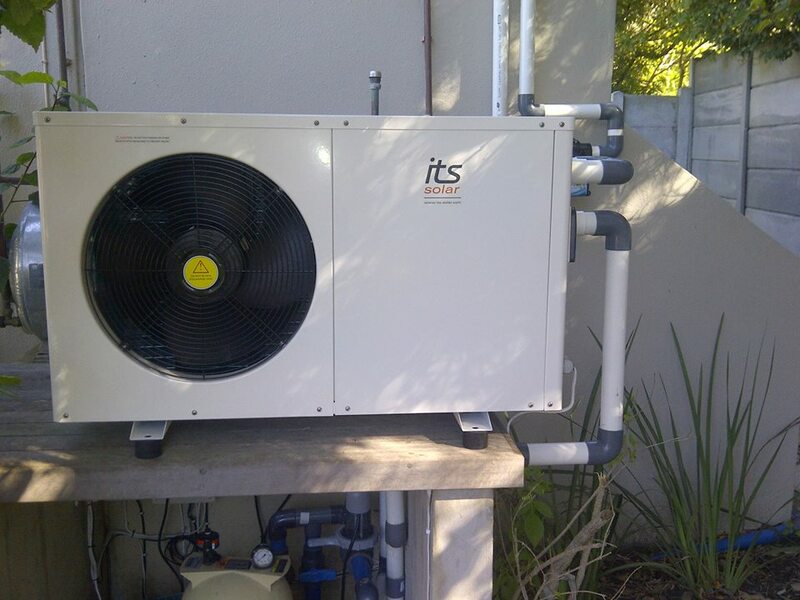 The heat pump concept is recognized as one of the most economic methods of swimming pool heating. Two types of energy sources are utilized to produce the required heat output, the heat from the ambient air and electrical power used to run the compressor. For every unit of electricity Aquatemp uses, it produces 4 to 6 units of heat, extracted from the ambient air. The efficiency of the heat pump is measured by the coefficient of performance (COP) - i.e. The ratio of energy output to energy input. This is dependent on the ambient air temperature and the temperature of the water of the swimming pool. As with all swimming pool heating systems, you are advised to use a swimming pool cover when the pool is not in use. This will keep evaporation, the greatest heat loss to a minimum, and so reduce the overall pool heating costs and unwanted frustrations. 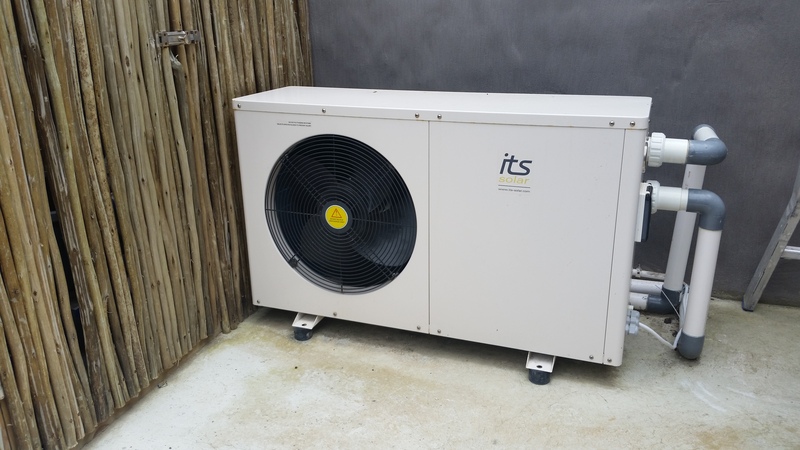 If no cover is used, it is essential that the heat pump be oversized accordingly. The chemicals used to treat swimming pool water (i.e. chlorine and hydrochloric acid) can be extremely corrosive. 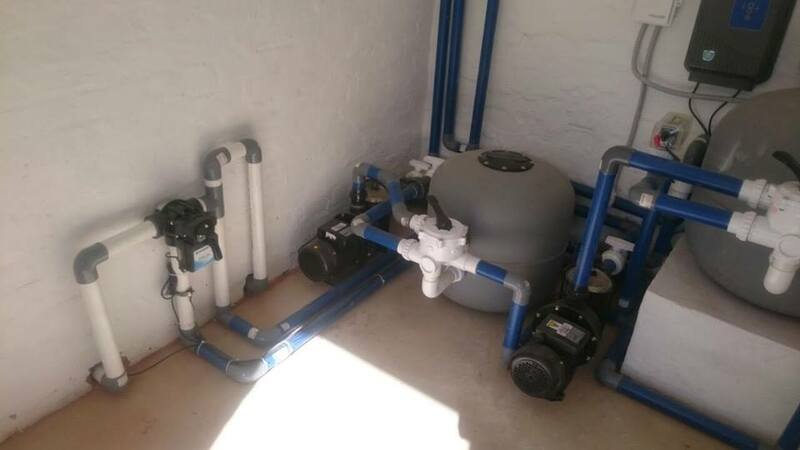 The heat exchangers on all Aquatemp swimming pool heat pumps are manufactured from pure titanium tubing which will not be corroded by swimming pool water. Most other heaters use copper or cupro-nickel heat exchangers, both which will rapidly corrode in pool water. 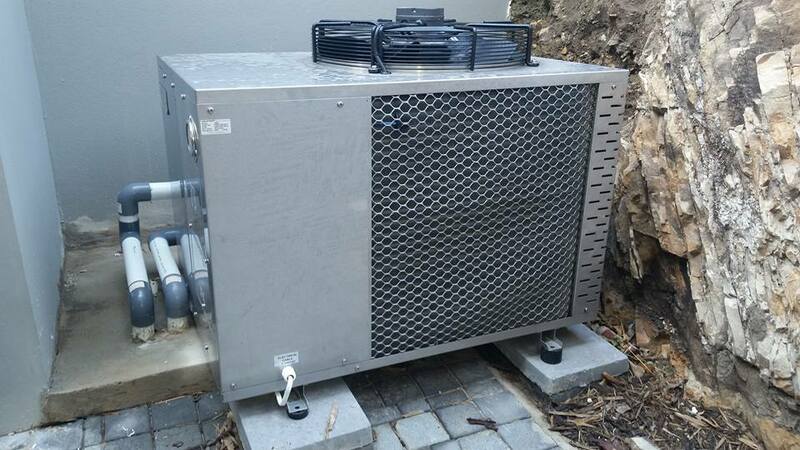 In the case of heat pumps (a sealed refrigeration system) if water enters the water heat exchanger (usually due to corrosion), the entire heat pump is ruined. 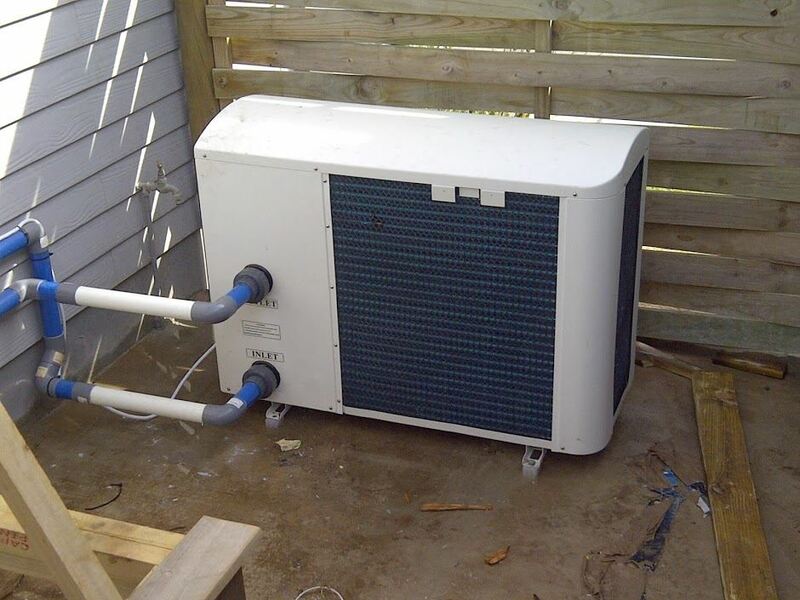 Once a leak has allowed all of the freon to bleed out (even if the heat pump is not running), the pool pump will produce enough pressure to force enough water into the heat exchanger and eventually into the compressor. Once water enters the system the copper tubing in the evaporator and the internal parts of the compressor will begin to corrode. Only heat exchangers made from commercially pure titanium tubing are virtually immune to all chemical corrosion. 1- What are the benefits of heating a swimming pool with an Aquatemp heat pump? For constant comfort. The Aquatemp has been designed to have an easy operation and unsurpassed reliability. The weather proof, neat and compact Aquatemp heat pump will bring you a level of continual comfort irrespective of cloudy weather conditions. It is a very efficient pool heater with user friendly controls that make it hassle free. Compared to other types of heating equipment, the Aquatemp heat pump is a very economical andefficient system. It will heat your pool to your desired temperature. 2- What are kW and BTU? Electricity is sold by the kilowatt-hour which equals 3412 BTU. BTU stands for British Thermal Unit. 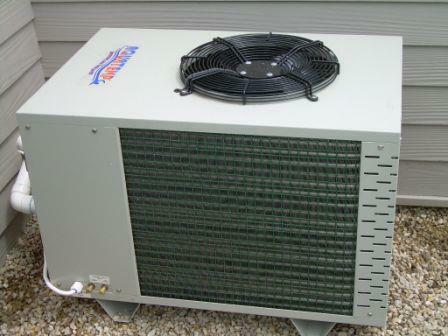 It is a unit of measure that some heat pump manufacturers use on their literature. COP stands for Coefficient of performance - i.e. The ratio of energy output to energy input. This is dependent on the ambient air temperature and the temperature of the water of the swimming pool. It tells you the energy efficiency rating the unit has. 4- Why should I use a solar blanket or pool over? As with all swimming pool heating systems, you are advised to use a pool cover when the swimming pool is not in use. This will keep evaporation, the greatest heat loss to a minimum and so reduce the overall pool heating costs and unwanted frustrations. A pool cover can cut total heat loss by 50% to 95%. 5- Will the Aquatemp unit run all the time? No! At the beginning of the season, you set the electronic programmable thermostat to the desired temperature. Once set, it will monitor the swimming pool water temperature and only start the unit when needed (i.e. the pool water temperature drops below the set temperature). 6- What is the operating cost? 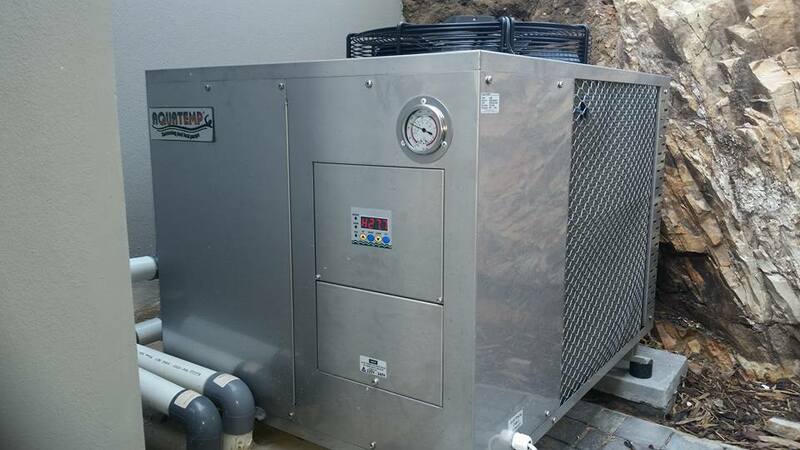 Compared to other types of heating equipment, with the exception of of solar heaters, which only heats when the sun is present, the Aquatemp heat pump is very economical. Two types of energy sources are utilized to produce the required heat output, the heat from the ambient air and electrical power used to run the compressor. 7- How is an Aquatemp controlled? It is controlled by the programmable electronic thermostat on the control panel which, has a very accurate digital temperature display. 8- What is the lowest ambient air temperature at which the Aquatemp can work? The Aquatemp FT-KD model is a heat pump with a positive de-ice system that allows the unit to efficiently heat your swimming pool water at near zero degrees Celsius ambient air temperatures. 9- Will the Aquatemp ever need more freon? The Aquatemp has a sealed refrigeration system. The factory charge of freon should last for the life of the unit. Freon is very stable and should not degrade or breakdown, even under severe operating conditions. If your unit needs freon, then it has a leak which must be located and repaired before adding freon or the problem will not be resolved. Fortunately, freon leaks are very uncommon and usually occur due to shipping damage.